Following the release of their well-received collaborative album, 44/876, Sting and Shaggy took their unlikely partnership on the road. Wednesday (Sept. 26) night, the duo hit the Pier 17 Rooftop in New York City for an energetic and timely performance. Midway through "Dreaming in the USA," an ode to America and a commentary on immigration, Shaggy stepped to the front of the stage, earnestly addressing the audience. "This song is for all the Dreamers, no matter where you're from, whether you're black or white, Christian or Buddhist, it doesn't matter; we have a saying in Jamaica, 'out of many one people,' and tonight we're all brothers and sisters here." Shaggy delivered his unity missive as Sting played a pulsing bassline and chanted the song's refrain/title. It was a significant moment in the melding of popular cultures: the Jamaican dancehall superstar and the British pop/rock luminary, both immigrants to the U.S. whose careers were launched along divergent paths within the Jamaican music spectrum, were now celebrating diversity at a time when U.S. immigration has become a daunting, divisive prospect. While Shaggy's music (like Sting's) has for decades brought together people from varying backgrounds, "Dreaming" is a departure for the deejay known for the ribald hits "Boombastic" and "It Wasn't Me." Then again, 44/876 has generated many surprises since its April 20 release. The unlikeliest duo of 2018, Sting and Shaggy are responsible for the year's best-selling reggae album and, even more remarkably, one of its most successful tours. The recently concluded 44/876 European tour leg grossed $10.8 million dollars, playing to 132,000 fans on the continent, spread across 23 sold-out shows, placing No. 4 on Billboard's Hot Tours tally. 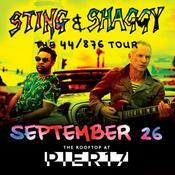 Throughout their performance at the spectacular outdoor venue, Sting, 66, and Shaggy, 49, consistently reaffirmed why their tour has been so successful. The duo displayed an effervescent, undeniable chemistry: Shaggy played Sting's hype man and Sting was Shaggy's bass player as they alternately took the lead, harmonized, and sang back up for one another (alongside their outstanding backup singers Melissa Musique and Gene Noble). Their nearly two-hour set was dominated by Sting's vast, exquisite repertoire of solo hits ("Fragile," "Love Is the Seventh Wave") and the punky-reggae classics from his years with The Police ("Roxanne," "So Lonely," "Walking On The Moon"). They performed Shaggy's chart busters, too ("Oh Carolina," "Angel," "I Need Your Love") and in between rendered songs from 44/876, supported by a superb band comprised of Sting's and Shaggy's respective band members, including Sting's longtime guitarist Dominic Miller. The concert began, appropriately, with Sting's "Englishman In New York," the 1988 single from his second studio album Nothing Like the Sun. In 1993 "Englishman" was cleverly remade by Bronx raised dancehall artist Shinehead; Shaggy greeted the Pier 17 audience by integrating Shinehead's "Jamaican In New York" into Sting's original and he received an uproarious response in the city where he once lived and launched his career some 30 years ago. "Reggae people this is for you," shouted Shaggy, introducing one of 44/876's finest tracks, the lilting "To Love and Be Loved," highlighted by Sting and Shaggy's cheerfully traded call and response vocals over a bubbling rocksteady rhythm. From there, the pair segued neatly, if unexpectedly, into a blistering version of "Message in A Bottle," Shaggy's hype man antics here transforming The Police's 1979 song title into a rousing sing-along chant, urging the boisterous fans up front to show those hanging by the bar in the back how it's done. The pace slowed down with Sting's sublime rendition of his 1993 single "Fields of Gold," Shaggy's favorite song written by his colleague and steady companion of the past year. The raspier tones of Sting's still supple vocals brought a deeper, reflective tone to the set's unhurried material including "Shape of My Heart," which featured a dazzling solo from backup singer Gene Noble. Comic relief arrived with "Crooked Tree," 44/876's nod to the spate of judge songs recorded in Jamaica in the mid-'60s. Shaggy, attired in a black robe and a white wig, portrayed Judge Burrell, charging Sting, an unidentified defendant who made a quick change into prison stripes, with a litany of crimes. The show began 15 minutes early, at 7:45pm, with the aim of avoiding a pending storm. The initial raindrops arrived in the set's last half hour, which included a spirited rendition of 44/876's first single "Don't Make Me Wait." "Boombastic," "Roxanne," "Every Breathe You Take" and "It Wasn't Me" followed, with Sting providing the counterpoint to Shaggy's dubious advice on the latter. The encore brought Sting's notable delivery of "Desert Rose," his mesmeric 1999 collaboration with Algerian Rai singer Cheb Mami. With the timing of a precisely executed special effect, the skies opened up and brought forth an unrelenting downpour as the audience joined in chanting the song's lyric, "I dream of rain." Nonetheless, the audience remained in place, soaked while soaking in the final moments of an exceptional night of music from two veterans whose talent pairing, few initially believed, could sustain an album together, much less grueling tour demands. On September 26, global music stars Sting and Shaggy performed at Pier 17 in New York City, for a great turnout of fans. They kicked off their set with "Englishman/Jamaican in New York," where both artists paid homage to their roots. With this song, they instantly immersed their listeners in their set. It was followed by "44/876," the title track of their collaborative album, as well as "Morning Is Coming." "Every Little Thing She Does Is Magic" had a neat groove to it, and equally impressive was "If You Can't Find Love." Their live versions of "Message in a Bottle," "Fields of Gold" and the liberating "If You Love Somebody Set Them Free," were refreshing and distinct. After a laid-back version of The Police's "So Lonely," they closed with the fan-favorite "Roxanne," which was incorporated as a medley with Shaggy's "Boombastic," which was sheer bliss. They returned for a spell-binding rendition of "Desert Rose," which happens to be this journalist's personal favorite Sting tune, and Shaggy's "It Wasn't Me" was a pure classic. They concluded with a well-received version of The Police's "Every Breath You Take." Their 44/876 album is available on all digital retailers by clicking here. Overall, Sting and Shaggy brought their mellow vocals to Pier 17 in New York City, and the result was magical. Despite the pouring rain, Sting and Shaggy had their fans with them every step of the way, and their collaborations were a match made in musical heaven. They are worth seeing live together whenever they perform in town. Their live concert at the Seaport District in New York garnered an A rating.